While I was planning events to celebrate my 60th birthday with a visit from our son, Ben, I found that this estate was going to be having an open house during the weekend that he would be here. We had passed the property many times in our travels to the Blue Ridge area but had never seen the house or been on the property. 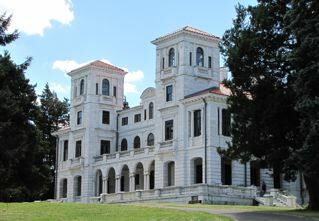 This was a summer place for the Dooley family, who had also built a beautiful estate in Richmond, called Maymont, which we have visited several times. This 52-room, 23,000 square foot home is in the process of being restored with hopes of being a bed and breakfast. The original building process began in 1912 with 300 artisans and took eight years to finish. The exterior is white Georgian marble and is partially based on buildings in the Villa Medici, Rome. It has quite a history as you can read on my photo album journey through the place.